•	15 flakes of kollaj. •	3 cups of milk. •	1/2 a cup of rose water or blossom water. •	2 cups of syrup. •	1/4 a cup of fine pistachio. •	2 3/4 a cup of milk. •	1/2 a cup of sugar. •	Prepare the stuff and set it aside until it cools. •	Add rose water to milk and stir it. Pour a big tablespoon of milk in the tray. •	Fold the kollaj flake and dunk it in the milk in the tray on both sides. •	Put a tablespoon of the stuff in the middle of kollaj and fold the corners on the stuff quickly like a square or oblong shape (7×7cm). •	Press on the square or oblong to get rid of the excess milk. •	Row the squares of kollaj in a tray that is painted with butter or oil, and then keep them in the fridge covered until the time to roast them. •	Put 3 cups of oil in a deep plate and roast kollaj on a medium heat to avoid being burned. •	Serve kollaj hot with a tablespoon of syrup and decorated with pisatachio. The stuff: •	Put semolina in a pot on backburner and stir it with a wooden spoon until it becomes well heated (the color mustn't change). •	Then add milk gradually to semolina and stir the mix continuously. 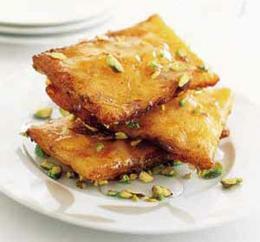 •	Add sugar to the mix of milk and semolina and stir the mix until it boils. •	Leave the mix boil on backburner for 7 minutes with continuous flipping. •	Add blossom water to the mix and stir, then raise the pot from the heat and stir the mix. •	The mix must be solid like solid yoghurt. •	Paint a tray with butter and pour the stuff on it to cool and solidify.